Herlihy’s work brought him celebrity in his own time. Like his close friend and mentor Tennessee Williams, Herlihy was a gay author whose works delved into taboo subjects and broke new ground for what was acceptable to major publishers. His 1958 play Blue Denim confronted teenage sexuality and abortion and was praised in a newspaper column by Eleanor Roosevelt. His novels were acclaimed by writers like William S. Burroughs, Paul Bowles, Nelson Algren, and Williams, who praised Herlihy’s writing as “luminous,” “true,” and “perfect,” hailing him as the most significant new writer since Carson McCullers. His novel Midnight Cowboy was made into a film starring Dustin Hoffman, and won an Academy Award for Best Picture despite being given an “X” rating. 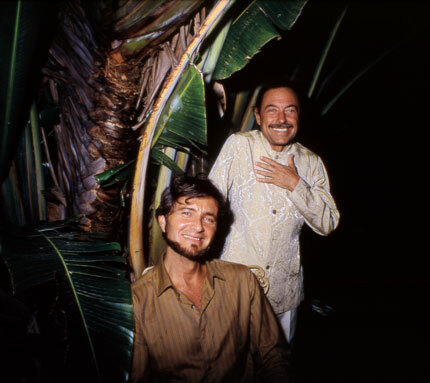 Herlihy (seated) with Tennessee Williams, a friend and mentor, in front of the travelers' palms at Williams's Duncan Street home. Key West’s influence on Herlihy is plain from the settings of his fiction. In All Fall Down (1960), the adolescent protagonist Clinton Williams follows his idolized but ne’er-do-well older brother Berry-Berry all the way down to “Key Bonita,” a stand-in for Key West. His 1967 short story “A Story that Ends with a Scream” is set in Key West, as is “Ceremony for the Midget,” in which the midget is an apparition or hallucination symbolizing the spirit of a beloved bar that is closing. “The Day of the Seventh Fire” captures the mood of Key West in the 1930s. And at the end of Midnight Cowboy, Joe Buck and Ratso are riding a Greyhound to the sunny Florida of Ratso’s dreams when tragedy strikes. 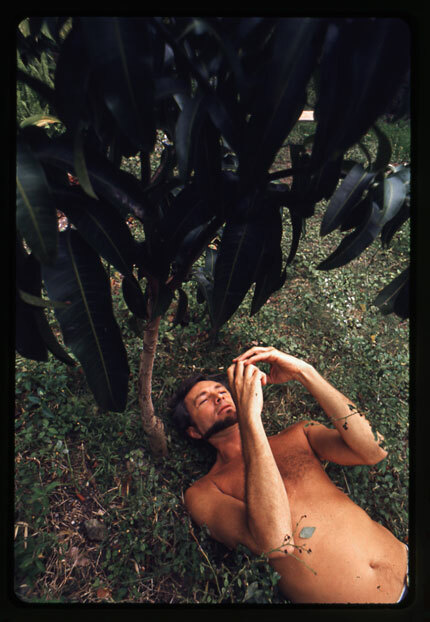 Herlihy beneath a young mango tree in his backyard. By the start of the 1970s, the combination of Herlihy’s celebrity and local reputation as protector of the longhairs led to him feeling overwhelmed and desirous to leave Key West. The growing tourist industry was another factor. It was simply getting too hard to work. From California he wrote Lyle Bonge in 1973 that he was going under the name of Jamie Hathaway (a family name) in an attempt to lay low: “I’m trying not to repeat the errors of Key West where I had finally become such a public entity there wasn’t much for me to chew on.” In 1972 he purchased a farm in Hop Bottom, Pennsylvania with the idea of establishing a communal lifestyle for himself and friends like his mentor from Black Mountain, potter and author M.C. Richards. He sold his Bakers Lane home in 1973. Although he left Key West hoping to find a situation more conducive to his writing, Herlihy would never publish another work of fiction after leaving it. He lived mostly in Los Angeles, in Hollywood and Silver Lake. He unfolded ideas in letters and worked on manuscripts including a historical novel of the Midwest and a biography of eccentric artist Henry Faulkner, but these projects never came to fruition. He acted in several plays and movies, including the 1981 Four Friends, directed by a classmate from Black Mountain, Bonnie and Clyde director Arthur Penn. Herlihy’s character in the film, a neurotic father, commits suicide in a shocking scene; sadly, more than a decade later, life would imitate art. Herlihy took his own life in October 1993. Michael Snyder lives in Norman, Oklahoma, where he received his doctorate and teaches American literature at the University of Oklahoma. He is planning a book-length critical biography of James Leo Herlihy and is revising his dissertation on James Purdy for a book to be published by a university press. Bud Lee was U.S. Military Photographer of the Year in 1966 and Life Magazine Photographer of the Year in 1967. More of his groundbreaking work from the 1960s-1990s can be found here and here. Lived and worked there from 1978 to 1994…. ;;The times they were a changing”. Still miss the Key West of the good ol’days. My parents bought James Herlihy’s childhood Detroit home from his mother and father in 1956. I was a 12 year old budding writer (mostly intensely weepy poems about unrequited love) and inherited the bedroom that had been his. My sister got the bedroom that had been his brothers’. He wasn’t yet a famous author but I remember being quite awed a few years later when I realized who had written Blue Denim and Midnight Cowboy. His parents visited with my mom and dad quite often over the years. I guess maybe they wanted to see their old home again. The house is gone now–vandalized many years ago and finally torn down. Wish I could have met James. His parents were very nice people. I was James Leo Herlihy’s nephew. He was my father’s brother. Very interesting to hear this since I have really no connection to the family anymore. Everyone has passed away from that generation. Joe, If you would like a description of the house and neighborhood let me know. I would really like to talk to you about some strange occurences that happened in that upstairs bedroom. Is your father still alive? Would sure like to ask him some questions. You can reach me at [email protected]. Hope to hear from you. Thank you for posting this. I am working on a book on James Leo Herlihy. I would love to talk to you about your family sometime. I have spoken with relatives in Chillicothe, Ohio. Hoping to hear from you. Joe, I just came across this site and saw your name. As I recall, your curiosity was insatiable regarding JLH, not sure whether I coaxed your inquisitive mind into dead-ends or some degree of success. While I was profoundly straight, Jamie and I quickly became best of intellectual and social friends – we often held hands under the dinner table to ensure unanimity; I have never met anyone so similar to my mind and character than your uncle. If your curiosity remains, give me a call/email if you are ever near Newport, RI., I might fill in a couple gaps, all in respect for Jamie. Your uncle was an incredible writer. In 1969 at age 17, I began reading Midnight Cowboy at a about 9 pm one school night. I finished at 4 or 5 am and was so devastated by the ending I couldn’t even try to go to school. My life would never be the same after that. Nothing in my entire life affected me as much as that book. I get it that some people reading it today don’t understand the hype, but that was way back in 1969 and James had taken us into uncharted waters. I read All Fall Down and found it brilliant, some 40 years ago. Did you ever have a chance to meet your uncle? Thank you for the wonderful article & photos. I came across Mr. Herlihy’s writings after reading that William Inge’s screenplay was based on a James Leo Herlihy novel (All Fall Down). Of course, from there I had to find everything he’d ever written and devour it. I can’t wait to read the biography. And I feel lucky to have landed here and see posts from a former inhabitant of his childhood bedroom and from his nephew. I have several letters from Mr. Herlihy from 1987.. I wrote to him thru his agent and he hand wrote me letters back. I still have them. I asked him all kinds of questions about ” Midnight Cowboy” both the novel and the movie.He was kind enough to take the time to write me and I was very impressed with that. Hi Rick, I would love to read those letters. Is there any chance you would be willing to make photocopies of them for me? I remember Baker Lane very well-even lived there in one of the guesthouses separate from the main house for a few months. We definitely had some great times there-(though I was not gay myself whereas most people hanging at jamie’s were) – I still found acceptance and enjoyed many a good acid trip and many lievly a conversation there. I met Jamie when I returned from overseas, in November 1968. I was stationed at the Naval Base, on the USS Calcaterra. I brought back some Marijuana and met some hippies to share it with and they took me over to Jamie’s house and we smoked, tripped and had great conversations there. Listening to the music of that generation was also beautiful and new. Met many of his friends, who were from all parts of the country, from east to west, north to south. Everyone was wonderful and left a lasting impression of love and acceptance and was the footnote to my personal journey into the hippie era , after my discharged from the military. I will always remember Jamie and friends and 709 Bakers Lane! I lived in KW as a child, Mr. Herlihy’s parents , Bill and Grace lived behind us. We visited them often and sat in,their backyard garden. We gave them momentis of grade school and had biscotti for the first time with them. I never knew of James at the time, but we loved them like grandparents as ours lived out of town. Great memories of two very loving people. Too wild, Sara! To read someone’s comments about my grandparents is really something. Sadly, my grandfather (Bill) passed before I was born in 1969, and my grandmother (Grace) passed when I was only two, in 1976. I don’t remember her. I wish I would’ve had the chance to know them both. At least for enough time to have a few memories. I’m producing an independent documentary about an underground gay and artist culture in Lexington, KY since the Civil War and some of the characters dead and alive, include Henry Faulkner (painter), Tennessee Williams, Robert Morgan among others. Henry, TW and Jamie Herlihy are part of the stories that are told having impacted a younger generation of gender bending, sexual outlaws, camp, and drag queens. I’m looking for images of Key West of the 60s, and anything that might include Henry Faulkner, Williams and Herlihy, houses that may have housed any of them. I would be happy to share what I have including oral history. 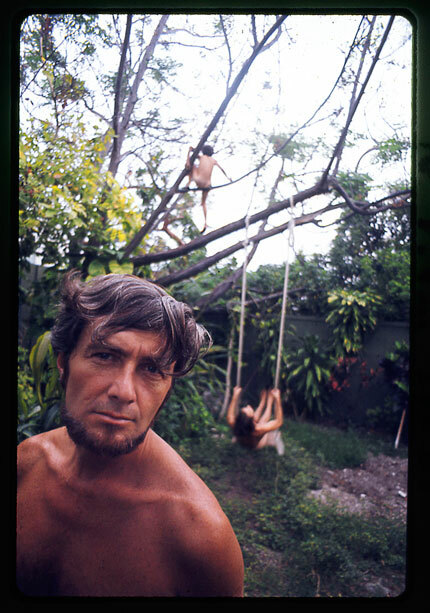 I remember well Jamie’s backyard and swinging to the sounds of Donovan. I came to Key West with Walter Starcke, and lived with him on Pearl Street until a dispute landed me on Tennessee’s couch for a brief spell. Watching Space Odyssey 2001 and Yellow Submarine at the theater on Duval with Walter and Jamie. Head Beach and evenings at Capt Tonys. It was a special time. I am co-authoring the sequel book on the history of Silver Lake (the first one is entitled “Silver Lake Chronicles: Exploring an Urban Oasis in Los Angeles”). The 2nd book will focus on the Iconoclasts, Bohemians &Visionaries of the Modern Era and will include a story on James Herlihy. We are hoping to find photos of Jamie in connection with his life in Silver Lake. Especially helpful would be a photo of the Silver Lake house or photos of him hanging out there or in the community. If you could give us a lead on this it would be quite valuable. We have photos of the house now but it has been drastically altered since Jamie’s time there. The pillar is not there but I think I found your acid. Do you have any old pics of the house Larry? I lived at 709 Baker Lane mid/late 1970s. When I moved out (78?) Kirby C. basically gutted the interior to make it more marketable as a rental so most of what came before indoors is that long gone. I Think I know what Brian is talking about with the “pillar”….there was a low half-loft and definitely a skylight. Also the peephole in the gate. However, in my day most folks ignored the gate and either just climbed over the wall or went down the other side of the house (unfenced) It was kind of maddening. I lived there alone most of the time but people just came pouring in at all hours. I installed a wrought iron fence on that side. Still there? I’m puzzled by Larry’s reference to guest houses. Where? There was a tiny shed, always flooded, against the center of the back fence. Really tiny, no windows, dirt floor, hardly a guesthouse. I can see from the lead photo above that the fence was in the same place in Herlihy’s day and the corner of the yard shown was the same. The other side had a funky fish pond. No room for guesthouses anywhere else. In my day, Henry Faulkner still rode around town and down the lane on his bicycle, in his mother’s wedding dress, singing blues songs (great voice actually) every full moon. Lots of ghosts (and a few ghouls) in my day but none were Herlihy’s then as he was still alive.